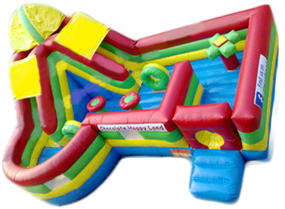 The little ones will have tons of fun in this obstacle course/slide. Has an inflatable safety step at the entrance so they don't get hurt climbing. Parents can easily view the children while they play, and netting at the top of the slide keeps them from falling off.